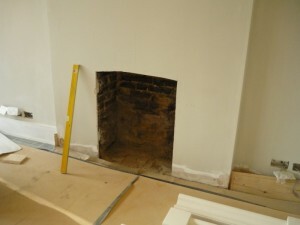 Qualitas Construction came to us to commission a new fireplace installation for one of their projects. Their client based in Wandsworth, London, wanted a simple limestone Bolection frame from Chesney’s. 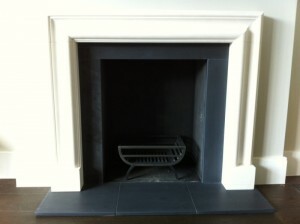 In addition to the fire surround, we also fitted some slate slips and a hearth. The limestone Bolection frame is of simple modern design with clear architectural form to ensure the fireplace remains the focus of the room. Pictured here with a modern cast iron fire basket. It is the perfect reproduction fireplace for those wanting a clean, contemporary feel. This choice of fireplace is definitely one of the most popular fireplaces amongst our clients. View another limestone Bolection frame fireplace installed by The Billington Fireplace.